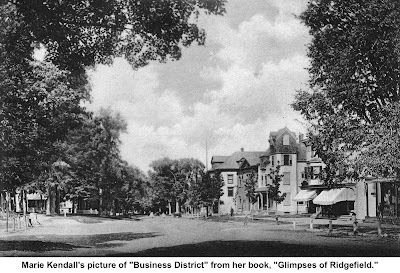 Ridgefield was blessed to have Joseph Hartmann photographing its people and places from the 1890s into the 1930s. But even before Hartmann turned his camera’s eye on Ridgefield, a remarkable woman began recording “glimpses” of the community — from streetscapes to house portraits to farmers plowing their fields. And it all started because Marie Kendall couldn’t afford to pay a professional to take portraits of her children. Marie Hartig was born in 1854 in the German-speaking Alsace section of France, an area of some turmoil in the 19th Century. In 1872, when she was 18, her parents decided to immigrate to the United States. Almost immediately Marie enrolled in the School for Nurses at Bellevue Hospital in Manhattan, a pioneering nursing school that used Florence Nightingale’s rules for hygienic cleanliness. There, she ran into a problem: She fell in love with Dr. John C. Kendall, a resident at Bellevue. Hospital rules forbade “liaisons” between doctors and nurses and she was, in modern parlance, kicked out. That didn’t deter Ms. Hartig, who continued her studies and completed her nursing requirements at Charity Hospital on Blackwell’s Island in New York. She also married the doctor. But she did so in ways that were rather unusual in the 1870s. Marie told John Kendall that she did not want a wedding ring, which she considered a symbol of enslavement. Instead, she thought a watch would be a more practical symbol of love. What’s more, she did not wish a church wedding. Both the couple’s parents were shocked, especially John’s father, a staunch Congregationalist and leader of the First Congregational Church. John Calvin Kendall had been born in Ridgefield in 1847, a son of another doctor, Calvin H.
Kendall, one of the handful physicians in Ridgefield in the 19th Century. Dr. Calvin Kendall lived and practiced at what is now 85 Main Street, a few doors south of where the First Congregational Church is now (and, back then, the Big Shop, a carriage factory, stood). Of pioneering New England stock, Calvin Kendall was a Phi Beta Kappa graduate of Yale who earned his medical degree from the predecessor of Columbia University College of Physicians and Surgeons. He was a pillar of the local church, serving for many years as a deacon. 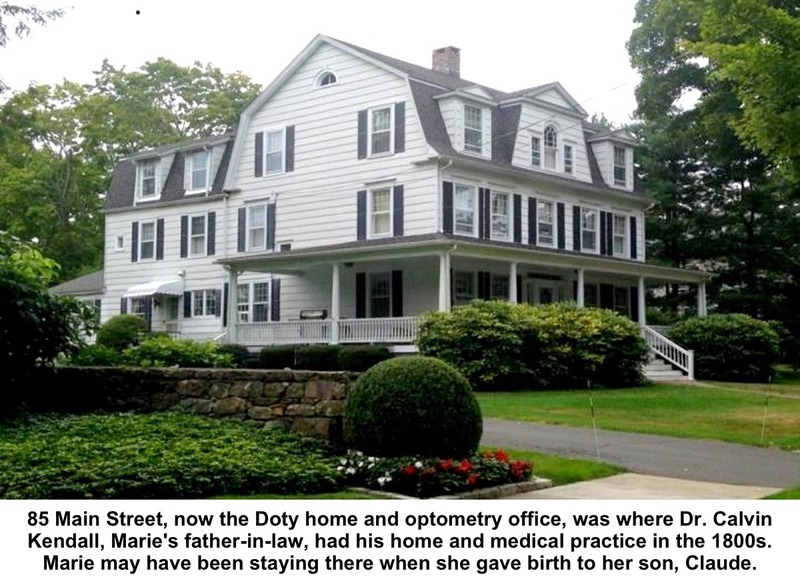 After their civil ceremony marriage in 1878, Marie and John Kendall are believed to have spent some time living in Ridgefield, probably with John’s parents on Main Street, while John practiced medicine in Norwalk. One of their four children was born here in 1884; Claude Roy Kendall was given his middle name to honor Marie’s mother-in-law, Jane Roy Kendall, who had died two months earlier. During this period of living in Connecticut, three of their four children were born. 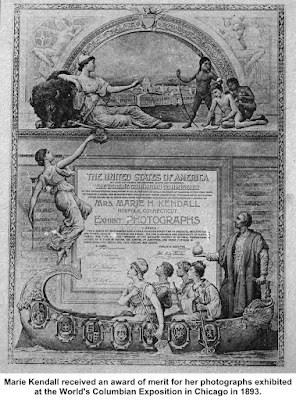 And it was her children that drew Marie Kendall to photography. 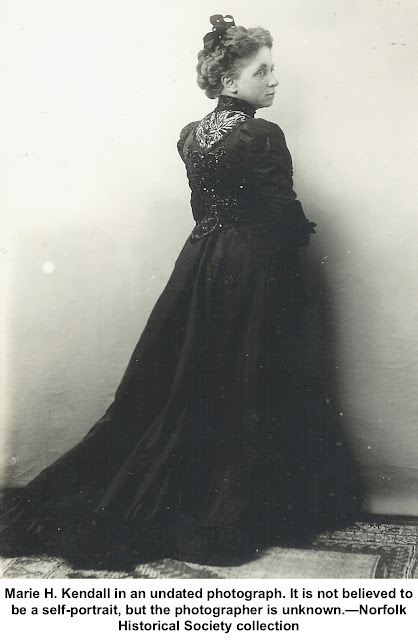 “Unable to afford photographs of her three children, Marie saved money to buy her own camera,” reports Ann Havemeyer, a historian of Norfolk, Conn., and director of its library. To earn the money for the camera, she knitted and sewed clothing to sell, “using skills she had been taught as a child in Europe,” said American Heritage magazine in a 1989 article. children to Norfolk, on the Massachusetts border in the northwest corner of the state. At Bellevue Hospital, one of John Kendall’s classmates had been Dr. William Henry Welch, a son of Dr. William W. Welch, a local doctor in Norfolk. (Dr. William H. Welch went on to found the medical school at Johns Hopkins University in Baltimore). The Drs. Welch encouraged John Kendall to locate in Norfolk. It’s not clear exactly when Marie Kendall began taking pictures. There are prints of Ridgefield scenes dated in the late 1880s and initialed M.H.K. By then she was living in Norfolk and probably visiting her husband’s family here. Marie taught herself how to use the camera which, in the 1880s, meant a large-size box fashioned of wood and using a bellows for focusing. Into this, a delicate glass negative, encased in a carrier, had to be inserted for each picture. The heavy and rather awkward device was mounted on a tripod. To take a picture, a cover was removed from in front of the lens for a brief period, exposing the 4 by 6 inch negative inside the camera. The photographer had to have a good sense of how long to expose the negative in order to get good results. ngredients for the developers herself, using such chemicals as sodium sulphite, potassium bromide, hydroquinone, and metol, a caustic substance that can lead to chronic dermatitis. After the plate was developed in those chemicals, it got a bath in a fixer that included even worse concoctions composed of extremely caustic sulphuric acid, sodium thiosulfate or “hypo”, and chrome alum, which can irritate both skin and eyes. permanent than silver papers and could better handle subtle tones of gray. In a 1930s letter, Kendall said she had by then long ago stopped developing negatives and did not sound the least bit sad about it. She seemed pleased to point out that her old developing room was turned into a coal bin. of Norfolk” were printed by the Albertype Company in Brooklyn, N.Y., which was well known for its thousands of postcards of communities in the Northeast (many of them from 1915 onward were hand-colored by “starving artists” in need of supplementary incomes). 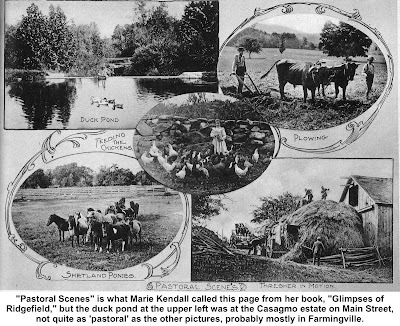 Gravure-printed on heavy paper, “Glimpses of Ridgefield” contains more than 100 pictures of Ridgefield taken in the late 1880s and the 1890s, including Main Street views, many mansions and historic buildings, schoolhouses and churches, farm scenes, and a number of scenics including a series on West Mountain that clearly took some hiking — carrying many pounds of equipment in dense Victorian clothing — to obtain. probably to people who wanted the glass, not the pictures emulsified on it. She kept only “a small group” that were “personally interesting,” most of which are now in the archives of the Norfolk Historical Society. The fact that Marie Kendall had 30,000 negatives reflects how many thousands of hours she must have spent at photography over three decades. At the same time, she was raising a family of four children and was a doctor’s wife who, as a nurse, probably helped with the practice. She also endured tragedy— her 21-year-old, Yale-educated engineer son was electrocuted by a wire while he was working for General Electric. Dr. Kendall, who had been active in the civic life of the Norfolk community, died in 1921. Marie lived until 1943. Clearly, her extensive exposure to photographic chemicals did not affect her longevity — she was 89 years old at her death. 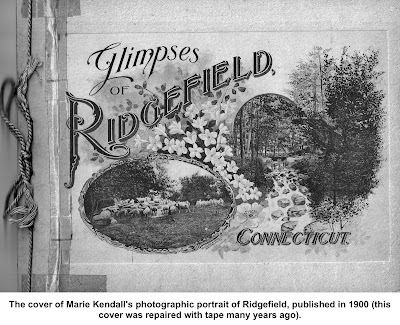 For decades after she stopped taking photographs, the work of Marie Kendall had been almost forgotten, except among a few historians of Norfolk, Litchfield County, and Ridgefield. 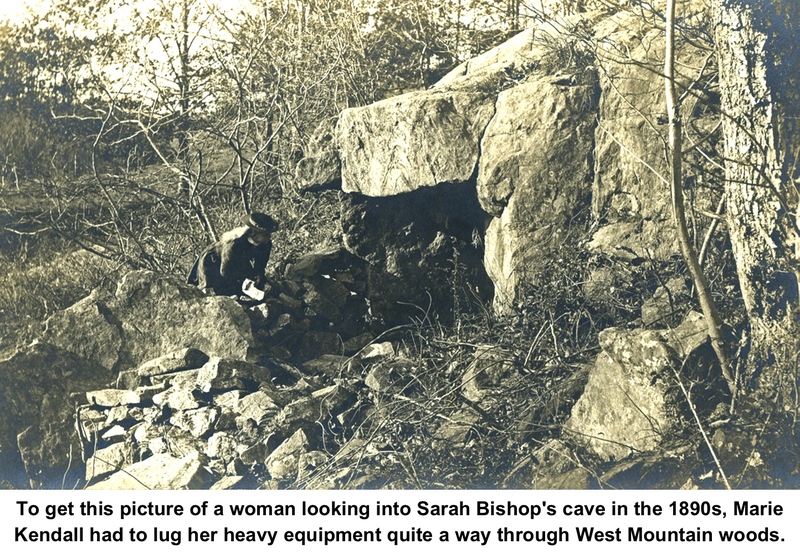 However, in 2013-14 the Connecticut Historical Society mounted an exhibit, “Through a Different Lens: Three Connecticut Women Photographers,” that featured her work and two other pioneering women. 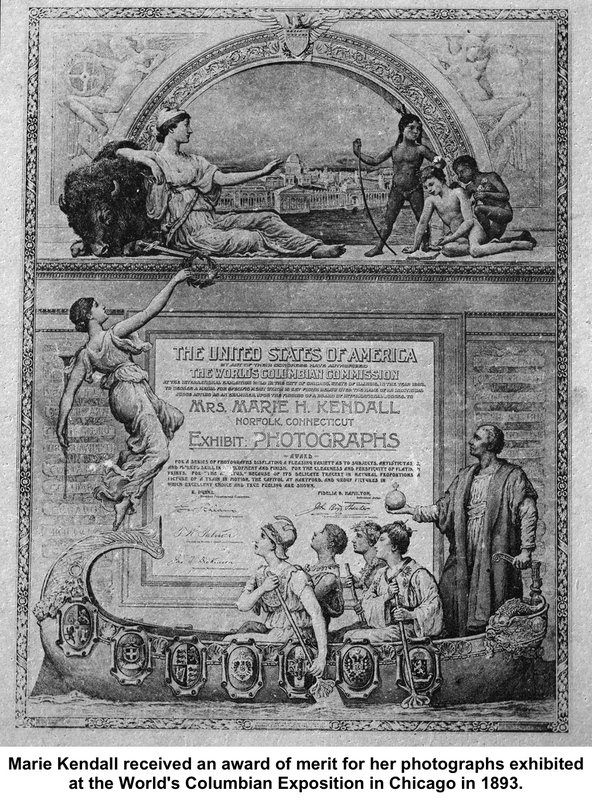 In 2018, major Kendall events are planned including a Norfolk Historical Society exhibit of her pictures, the digitizing of many of her images that will be placed online, and the publication of a book about her life and her photography.